The latest test of India’s Agni-I short-range ballistic missile was successful. On Tuesday night local time, India carried out a user trial of its Agni-I short-range, solid-fuel, nuclear-capable ballistic missile. User trials involve the test flight of a randomly selected unit from the existing inventory of deployed missiles to validate the system’s overall performance and the readiness of ballistic missile units. The test took place at 8 p.m.. The test flight was conducted by the Indian Army’s Strategic Forces Command off Abdul Kalam Island in the Bay of Bengal, off the coast of the Indian state of Odisha. The test, the second known nighttime trial of the Agni-I since its first such publicized test in April 2014, was reportedly successful. Nighttime testing allows missile crews to prepare for scenarios that may be operationally necessary. The Agni-I is the shortest-range and oldest missile in the Agni family of Indian nuclear-capable missiles. It is succeeded by the already deployed Agni-II medium-range ballistic missile, the Agni-III medium-range ballistic missile, and the Agni-III and Agni-IV intermediate-range ballistic missiles. A longer-range system capable of delivering larger payloads to near-intercontinental ranges, the Agni-V, is expected to be inducted soon. The Agni-I has a range of 700 kilometers, according to the U.S. Defense Intelligence Ballistic Missile Analysis Committee. It was India’s first nuclear-capable system to be tested in the late-1980s, nearly a decade before India conducted its first weaponized nuclear tests in 1998. However, the completion of the Agni-I’s development came after the Agni-II, which provided a more urgent capability for India in the aftermath of the 1999 Kargil War with Pakistan. The Agni-I was designed specifically with a range to hold Pakistani targets at risk. According to Hans Kristensen and Robert S. Norris of the Federation of American Scientists, India maintains approximately 20 launchers for the Agni-1. The system is thought to be both road and rail-mobile. 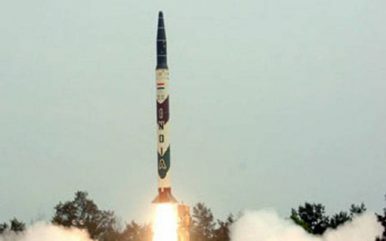 India successfully test fired a nuclear-capable Agni-I ballistic missile on February 6.